Dr Trevor DinesBangor University graduate and botanist Trevor Dines appears in a new Channel 4 series, Wild Things, produced by local company Cwmni Da. The series has a strong input from north Wales, with Bangor University academics and researchers also having contributed their expertise to the making of the programme, which looks at Britain’s amazing wild plants. In the six part series, Dr Trevor Dines goes in search of Britain’s wide range of amazing wild plants, accompanied by fellow presenters, landscape designer Chris Myers and lichenologist Sally Eaton. In the first programme, Roadside, to be broadcast on Monday 21 January at 8.30 on Channel 4, the team head to the Midlands and the heart of Britain’s road transport network. It might seem like an unlikely start point to look for wild things, but in the last fifty years these roadsides have become Britain’s latest nature reserve. Exploring the hard shoulders and soft verges they discover how one wild thing has become the fastest moving plant in Britain and why one very familiar British flower has become a kerbside imposter. Dr Vera Thoss at Bangor University’s School of Chemistry lent her expertise to this programme, sharing her love and knowledge of the bluebell. Dr Thoss and her research team were sent samples of bluebells to analyse their scent, which is at risk of becoming a distant memory with the ’invasion’ of the unperfumed Spanish Bluebell. 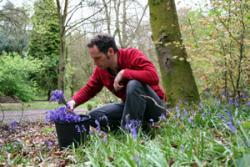 Dr Thoss said: "It was a pleasure to work with Trevor on the bluebell scent because of his botanical knowledge. While we do know our chemistry, having the certainty of dealing with a hybrid surely helps. It was also really interesting to measure the difference in scent, even if we will need to do a lot more work to find out what the compounds are. Dr Thoss is one of the few people in Britain licensed to sustainably manage a wild bluebell population for the sale of bulbs and seeds. An Organic Chemist at the University’s School of Chemistry, Dr Thoss is interested in environmental and ecological chemistry and in some of the useful chemical compounds found in plants. Dave Preskett of the University’s BioComposites Centre provided expert advice to the programme makers for two subsequent programmes. The programme makers also used laboratories, facilities and equipment at the University for some of the experiments and demonstrations carried out in the programme. Dave Preskett said “We were able to assist the programme makers with an interesting demonstration to illustrate how a remarkable plant, the pigmy weed, survives cold weather. Providing advice for a television series was an interesting experience and an insight into how such programmes are researched and constructed. Dr Trevor Dines graduated from Bangor University in 1990 with a degree in Botany. He says: “I was lucky enough to grow up on a farm in Hampshire, I came across a wild orchid in a shaded wood one day. That single discovery launched me on a path to learn all the wild plants I could find and ultimately my lifelong fascination with botany. Family holidays and college field trips opened my eyes to north Wales so when the opportunity arose to study plants in a different country, with a wonderful outdoor environment and very different flora to Hampshire, I jumped at it. In those days, Bangor had world-class a School of Plant Biology, with many excellent botany lecturers. It was exciting and different – the course was not focused on biochemistry and physiology but included plant anatomy, morphology, genetics and of course study of the British flora. It was pretty much unique.